Camp Maud Isbell Berger was originally organized to give a quality camping experience to Junior Grange members across the State of Connecticut. The camp is now open to all children (ages 7-14) in an effort to give boys and girls in Connecticut the knowledge and skills gained from outdoor living as well as the development of rich and lasting friendships. It is the desire of the Camp Maud Isbell Berger Board of Trustees to give every child, regardless of race, color, national origin or religion, an opportunity to attend summer camp by keeping the cost within the reach of all. It is also Camp Berger's goal to aid all campers in attaining happy hearts, healthy minds and bodies, and generous spirits, in a democratic situation, amid the beautiful and inspiring surroundings of Winchester Center, Connecticut. 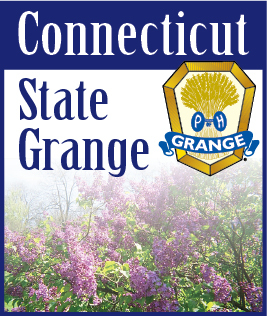 MARCH 10, 2019 -- Camp Berger, owned and operated by the Connecticut State Grange and nestled in Connecticut’s Northwest corner, has been home to the only outdoor pond hockey tournament in the state. JUNE 19, 2018 -- As camp season is rapidly approaching, we offer the following article about Camp Berger that appeared in the September 1956 National Grange Monthly magazine. Camp Berger . . . 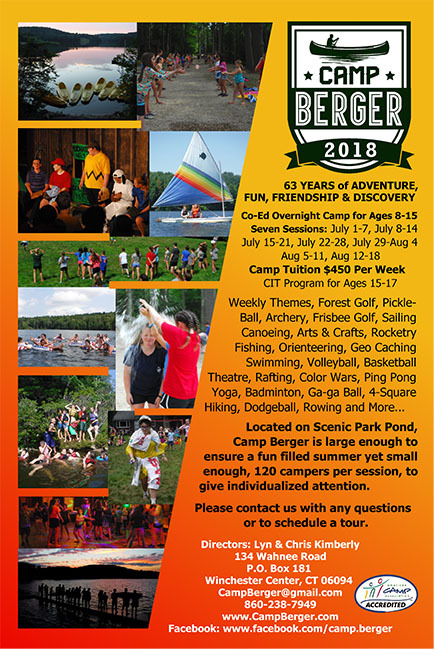 Please come and visit the camp and see why Camp Berger has made a special place in the hearts of campers for over 60 years. Open Houses will be held in the Spring - Dates to be announced. For more information, please e-mail director@campberger.org. Your Doantions were GREATLY appreciated!